You may have heard of the Giraffe restaurant chain but you might not know that Tesco bought the company for £48.6m last year. Since then Tesco have been converting some of their cafes into Giraffe restaurants and their aim is to create a compelling retail destination where customers can meet, eat and drink as well as shop. 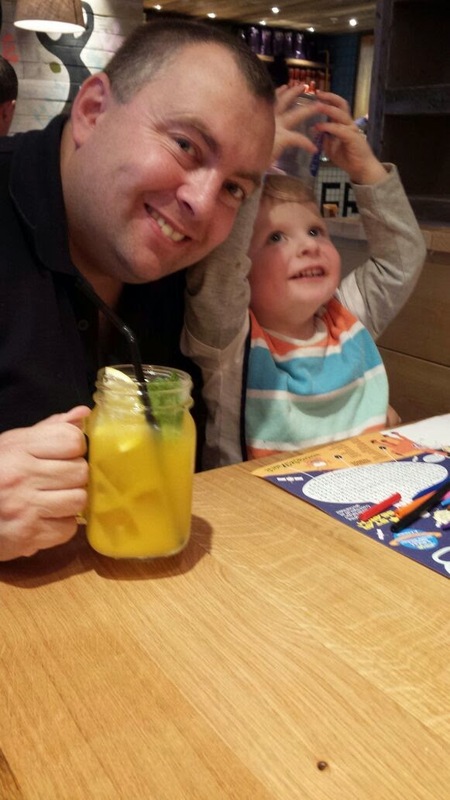 We were lucky enough to try out the new Giraffe restaurant at Tesco Extra, Bournemouth last week before it opens to the public and we were really impressed! My first impression was that it was very family friendly and we couldn't have received a warmer welcome. 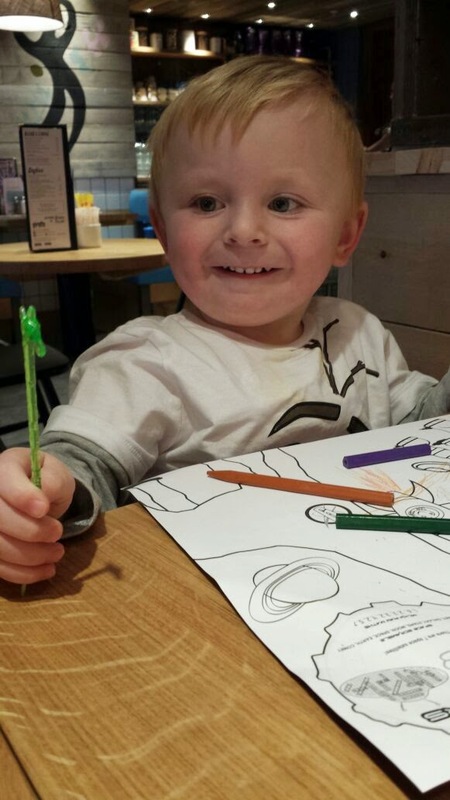 Elliot was given a balloon, crayons and activity sheet and even a cute little plastic giraffe! The decor was a world away from the standard fare of the old Tesco cafes but that was definitely a good thing. It was bright and colourful with lots of tables and smartly dressed staff. And lots of highchairs!! There was lots of choice on the menu and after lots of deliberation I went for "The Giraffe" burger (no giraffes were harmed, it was beef!) and my husband chose the Piri-Piri Chicken. The kids menu was equally as tasty looking and featured favourites such as burgers and hotdogs but lots of healthy options too. 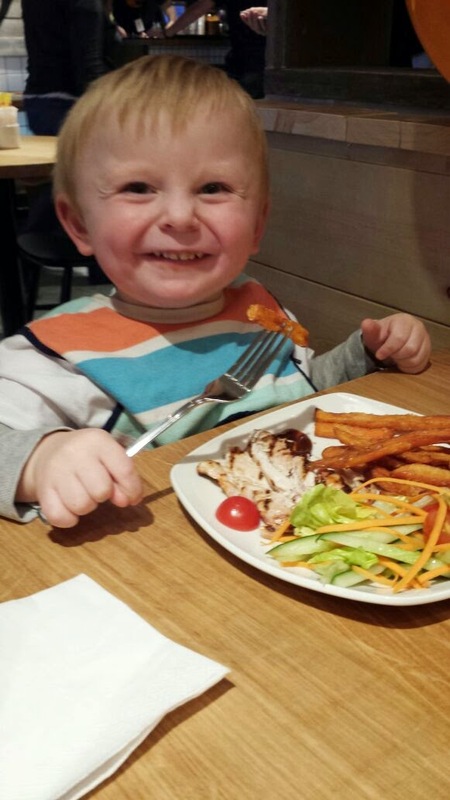 We went for the grilled chicken breast with salad and sweet potato fries for Elliot....mmmm! 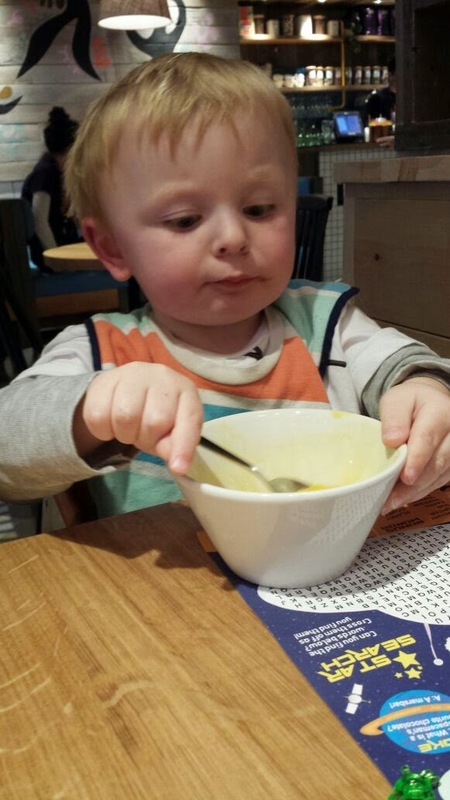 The restaurant was quite busy but our food didn't take long to arrive - always good when you're dining with a not very patient toddler! 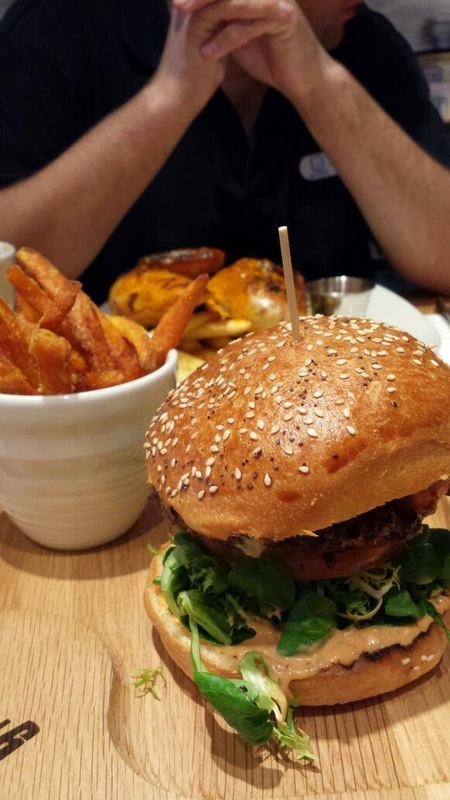 My burger looked amazing and tasted even better - easily one of the nicest burgers I've had in a long time. Best bit though was the sweet potato fries - you ahve to pay extra for these rather than standard fries but it's definitely worth it, they are SOOOOO good! Could have eaten more! The piri-piri chicken looked really tasty and Paul said it was equally as good as Nandos. Elliot's meal was a good size for a kids meal and he couldn't wait to dig in, no complaints from him! Moving onto desserts, Paul had the Steamed Lemon & Blueberry pudding whilst I went for the Banoffee pie. I did mean to take a photo but unfortunately we were far too busy munching to be thinking about snapping a pic! Elliot's pudding was mango sorbet and he ate it all! We were really impressed by Giraffe and the quality of the food. It's great that they are so family friendly and cater so well for little ones. I do think that some Tesco customers may be put off dining here if they are used to the prices of the old cafes but I hope they give it a try. Our favourite family restaurant is usually Frankie and Benny's but we will definitely be returning to Giraffe instead next time we decide to eat out. I went to Giraffe for the first time this week and LOVED it! I had the no-bun chicken burger with a quinoa salad. Delish! I agree about the prices, but it is certainly worth it. We enjoyed our meal there BUT I just can't see it working in Tesco. It's a treat meal out not a quick lets stop for a it to eat after shopping kinda place. I'd think nothing of popping in with the children for brekkie when it was a Tesco cafe, but when you do your shopping your trying to be savvy, save money, buy bargains you can't then go blow £30 on brekkie!?! Can you? Yes I agree that those wanting to pop in for a quick meal before their shopping may be put off, but I think if you can see past it being at Tesco and that it's just a regular restaurant. I also can't help thinking of all the elderly people that would pop into the cafe for their cup of tea, I can't imagine they will be paying the same price as before.